I think to many observers of China, People’s Daily (PD) has little worth outside of restating the Party line. They pretend that it is a reconstruction of the Ministry of Truth from 1984, whose only purpose lies in creating “truth.” Some even go so far as to argue that reading and quoting such a paper does nothing but affirm the Party’s leadership. In fact, bloggers, activists, and dissidents should be reading the People’s Daily, and, as I’ll show, often the most damning evidence against the Party’s rule can be found within its pages. Initially, I too was skeptical of the integrity of People’s Daily, but linked to it regularly, assuming that even the strongest proponents of China would find it difficult to argue with facts and figures from the Party mouth piece. After all, PD would have little interest in overstating China’s problems. Overtime I started to realize that stories were usually innocent on their own, but when taken with the bigger picture often portrayed a hypocritical and unjust state. The strongest example of this comes from two stories that seem at first glance to be completely unrelated; a female teacher burning seven kindergartners with a hot iron, and a man smashing the windows of two Mercedes-Benz. However on closer reading, one sees the vastly different values placed on the children of the poor and the possessions of the rich; the woman was held by police for 10 days, while the man was sentenced for 20 months. Intrigued by this discovery, I started combing the China Society page daily. The home page of the site interests me due to importance put on certain articles, but I have found the other sections reveal far fewer interesting stories. This is not to say that it is void of blatantly rosy accounts of China. The Politics section, is usually just pronouncements, where words like “urge” and “inspect” fill the headlines with little discussion of action (official reports appear here from time to time, which can be useful). Additionally, Foreign Affairs, rarely strays from the Party line, and replays the same few points ad nauseum (sovereignty, peaceful development, harmony…). At times though, the Foreign Affairs section fails to convey the Party line in a convincing fashion, like the infamous one sentence article, “No beating of foreign journalists by police: Chinese FM,” in response to an incident that took place during the Jasmine Protests. Despite some sensational stories that argue otherwise, the Party doesn’t actually inspect every article prior to publication. PD however does know that their role is to support the Party. They offer the clearest view of what the Party line is, and therefore serve as a useful window to China. The benefit of this to activists is that it is not always clear how one should support the Party. What many people are not aware of is that within the paper there is a great deal of latitude given to each author and each department. It is not uncommon for there to be contradictory headlines appearing within a day of each other. For example: “China to reduce rare earth export quotas” published Oct. 19, 2010 followed by “China denies reports of rare earth export quota cut” on Oct. 20, 2010. Both used quotes from the Ministry of Commerce and appeared prominently on the front page of the People’s Daily’s website. These contradictions show a clear lack of gov’t oversight, and that the editors are sometimes left guessing where the Party line is. Surprisingly, People’s Daily actually gives activists the tools to easily track down related stories that expose the paper’s previous position. 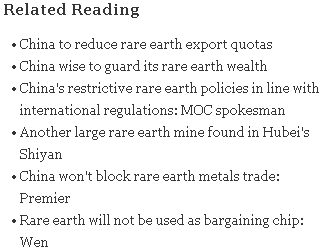 This appeared with the article "China denies reports of rare earth export quota cut". Unlike the Ministry of Truth in George Orwell’s distopia, the People’s Daily only produces new material, but doesn’t bother to delete the existing content. Even as Chinese censors scrub weibo of “sensitive words,” PD seems to be unaffected by these emergency efforts. This doesn’t mean that there aren’t attempts to obscure the past. 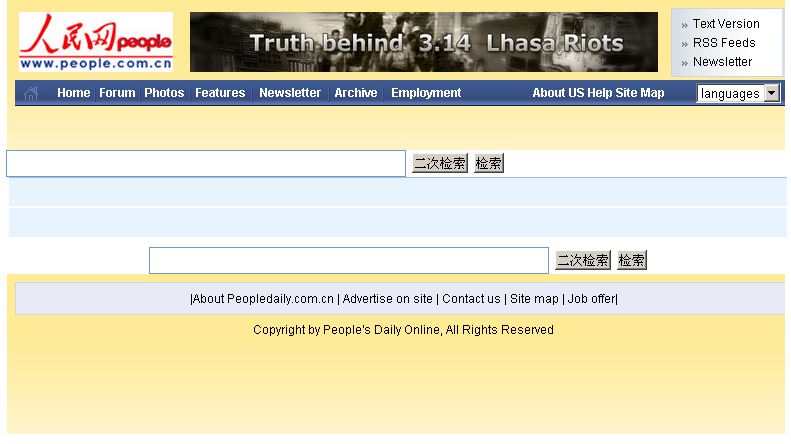 The search feature of the People’s Daily website does seem to employ keyword blocking. While a Google search of People’s Daily reveals over 1,350 articles related to the same topic. One finds that even though you can no longer access this information through People’s Daily itself, all of the articles still exist in their original form, even the initial article stating the practice has been banned is easily found. The People’s Daily also tries to maintain its relevance in society by reporting, often obliquely, on hot topics. Using the Google site search, I tested nearly 50 terms and found that People’s Daily seems at least to be discussing some of the most sensitive topics (Full results at end). A Google site search is performed by searching: “X” site:http://english.peopledaily.com.cn I further limited the search using Google’s tools that narrow the search by date of publication. The biggest gains in frequency are in line with which topics were most widely discussed in other major overseas newspapers. Unsurprisingly, “Weibo” went from just three mentions to 2,520 in 2011. Bo Xilai also experienced a massive jump in frequency from just seven mentions in 2010 to 253 mentions in 2011 as a result of his Red Songs campaign and political posturing. (Wang Yang of Guangdong, who was seen as Bo’s competitor, had 7 and 10 mentions respectively). Other words that have become more common in the last year include: “Stability” gaining 344% to 5,820 mentions; “Pollution” went up 1,094% from 355 mentions to 4,240, which shows the greater debate of the topic in the last year; “Food Safety” increased 3,083% going from 104 mentions to 3,310; and “Gutter Oil,” which was not mentioned a single time in 2010, was discussed 1,410 times in 2011. Any China hand would agree that these increases reflect the changes in the conversations we hear on a daily basis with our Chinese friends. I would argue that it is the result of a greater openness in People’s Daily to report on issues without waiting for official permission (in addition to the more obvious propaganda pieces). These shifts in reporting also reflect changes in gov’t campaigns. For example the period from January 1 – March 19, 2010 and 2011 only yielded 1 article related to Lei Feng; the same period in 2012 has resulted in 117. When you read People’s Daily everyday, you can start to intuit these shifts, but a Google site search allows you to quantify such changes. Thanks to the administrators of the People’s Daily website, information is no longer a tool that only the Party can wield. Important Notes: Google site search is not perfect. 3 page articles are counted as 3 separate mentions. While this skews data some, it is also representative of the importance attached to each topic. Recent photo pages also skew results, as an unrelated article may appear in the results due to the photo page being mentioned on the side bar. Data sets for Wukan and Muammar Gaddafi were strongly affected by this, which is why I placed an x in their columns for 2010. Additionally, mentions of “Democracy” may be pro-democracy or anti-democracy, but the value lies in the fact that it is increasingly being discussed. By T in Uncategorized on March 19, 2012 . This is a well-written piece, Tom. I don’t think anyone should be surprised that controversial topics appear in official media. As I’ve suggested numerous times recently, the Party is very interested in improving the health and well-being of Chinese citizens for any number of reasons. By “interested” I do not mean “concerned” in the paternalistic sense, although I would argue that specific individuals in the government are more concerned than others. The most important aspect of your analysis comes here: “when taken with the bigger picture often portrayed a hypocritical and unjust state.” This indicates your awareness of the need for depth analysis not restricted to counting mentions of this or that topic, which only gets one so far. While we are rightly concerned with manifest injustices (e.g., illegal detention), we really ought to be sensitive to how an increasingly “normal” state remains unjust, as when illegal detention was recently legalized. Increasing sophistication and “transparency” of PD is one indicator of this process of normalization. Speaking of depth analysis, would spotlessly clean steel plants or the return of Falun Gong necessarily mean a less exploitative society? Akin to arguments that I’ve tried making before. How can you understand something/someone if you are unwilling/unable to see their point of view? Furthermore, there is always something that can be gleaned from every source that is of use – even if you are unaware of how useful it may be at the time. Ignoring something because you think it is propaganda or useless information only serves to make you ignorant, not the other way around.